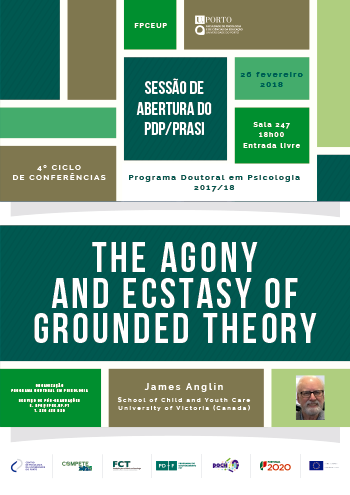 O 4º ciclo de conferências do Programa Doutoral em Psicologia (2017/18), recebe James Anglin, da School of Child and Youth Care, University of Victoria (British Columbia, Canadá), para uma conferência intitulada "The agony and ecstasy of grounded theory". A conferência acontece no dia 26 de fevereiro de 2018, às 18h00, na sala 247 da FPCEUP. Professor Anglin began his career as a child and youth care worker in a mental health centre in Vancouver after which he developed a 6-bed group home for adolescents in Victoria. He then pursued graduate studies, worked in social policy in Ottawa and with the Children’s Services Division, Government of Ontario, in Toronto. Returning to B.C. in 1979, he joined the faculty of the School of Child and Youth Care at the University of Victoria where he is Emeritus Professor and former Director. His major research interests have focused on a re-appreciation of residential care for children and youth (e.g. Pain, Normality and the Struggle for Congruence: Reinterpreting Residential Care for Children and Youth, Routledge, 2002). Currently, he is involved in researching the implementation and impact of a principle-based approach to residential care with colleagues from the Bronfenbrenner Centre for Translational Research at Cornell University. He has published in North American and international journals and child welfare texts on a variety of child and youth care issues. He is on the editorial boards of Child and Youth Services, International Journal of Child and Family Welfare, Journal of Child and Youth Care Work, International Journal of Child, Youth and Family Studies, and Reclaiming Youth at Risk. He has also visited child and youth care programs and offered keynotes, workshops and seminars in over 40 countries – focusing on extra-familial care with young people, creating theory from qualitative data, and the evolution of CYC as a global profession.